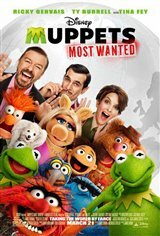 While the Muppets go on a world tour of the biggest cities in Europe, they find themselves in the middle of a conflict headed by none other than the biggest criminal in the world, Constantine, who's a dead ringer for Kermit the Frog. Helped by his sidekick, Dominic (Ricky Gervais), Constantine forcefully switches places with Kermit. Meanwhile, Kermit is mistaken for the criminal and sent to jail. Constantine joins the gang without any of them realizing he's not Kermit.